If you're a fan of Thai food, I'm sure you're familiar with sticky rice. There is something so special about its chewy texture and sweet flavor. If you have a desire to make it in your own kitchen but don't have the proper tools such as a traditional bamboo basket or stackable steamer, there are several other methods that work just as well. Once you try these alternative methods, I'm sure you'll be "sticking" to them for a while. What Makes Sticky Rice So Sticky? 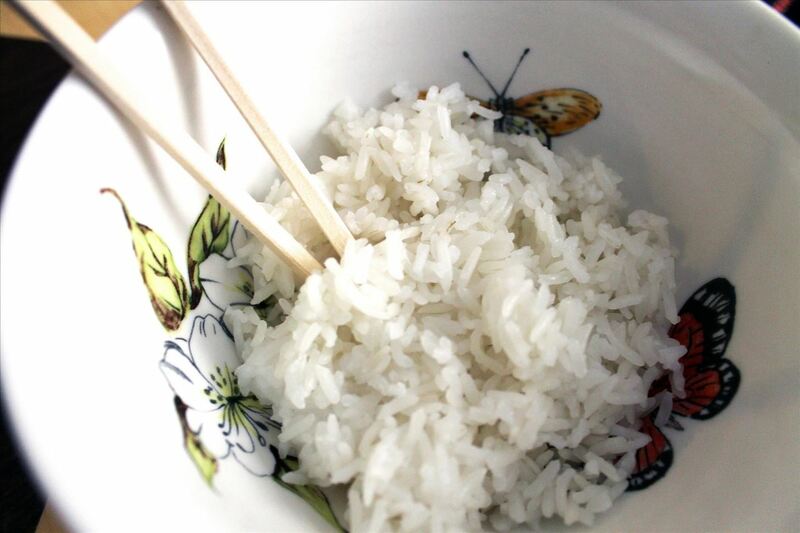 Sticky rice is a different type of grain from other types of cooking rice. Steaming, not boiling it, is also crucial for creating its unique texture. You want to use long-grain Thai sticky rice (or Thai glutinous rice), which should be available at your local grocery store or Asian specialty market. If the Thai variety isn't available, you can use almost any type of glutinous rice (which, by the way, is gluten-free, so don't be confused by the name). The results will be good, although not identical to what you get at your favorite Thai restaurant. Food Republic points out that glutinous rice gets its sticky texture from its high amylopectin (a type of starch) content. When activated by hot water, amylopectin breaks down easily. This is why sticky rice has to be steamed, not boiled. Thai Food and Travel breaks down sticky rice science: "If steamed or boiled the same way as regular rice, the grains will break down and become soft and mushy in consistency. Instead, Thai people like to cook it in such a way that the rice grains remain whole and have a firm, chewy texture. To accomplish this, the rice is soaked for several hours (four hours or more) until the grains have absorbed enough water to cook." As Fine Cooking describes the process, rice cooking consists of two things: the rice absorbing water, and the heat breaking down the starch. So, another key to creating great sticky rice is soaking, which cuts down on the amount of heat required. Soak one cup of rice for 2-3 hours or longer and drain it. Fill a large pot or deep pan with water and bring to a boil. Place the splatter guard over the pot. Once the water is boiling, turn down the heat to a simmer. Place the rice on the middle of the screen in an even layer. Try to keep the rice no higher than 3 inches for best cooking. Next, cover the rice with a bowl or heavy lid. 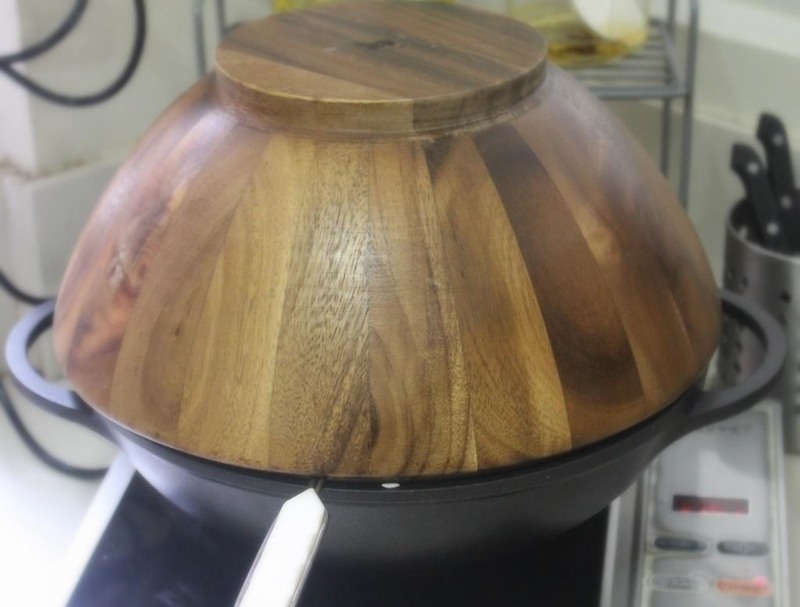 The higher/more domed it is, the better—it'll trap steam more effectively. 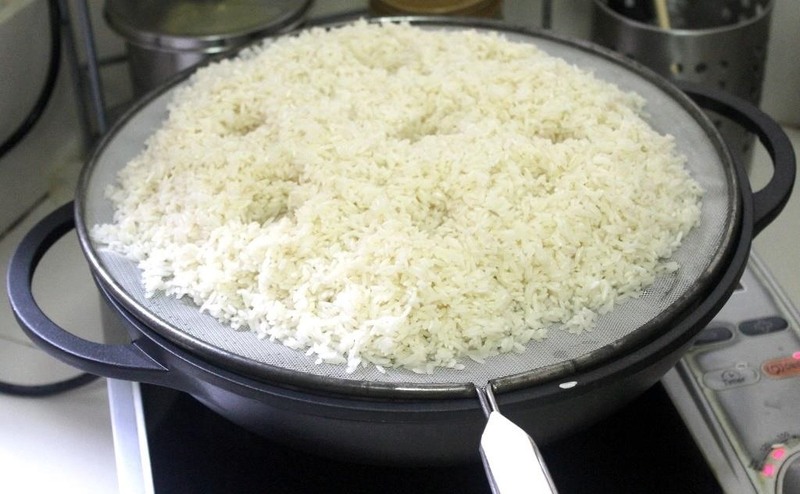 Steam rice for 30-35 minutes. It's good to turn the rice over halfway through to guarantee proper cooking. 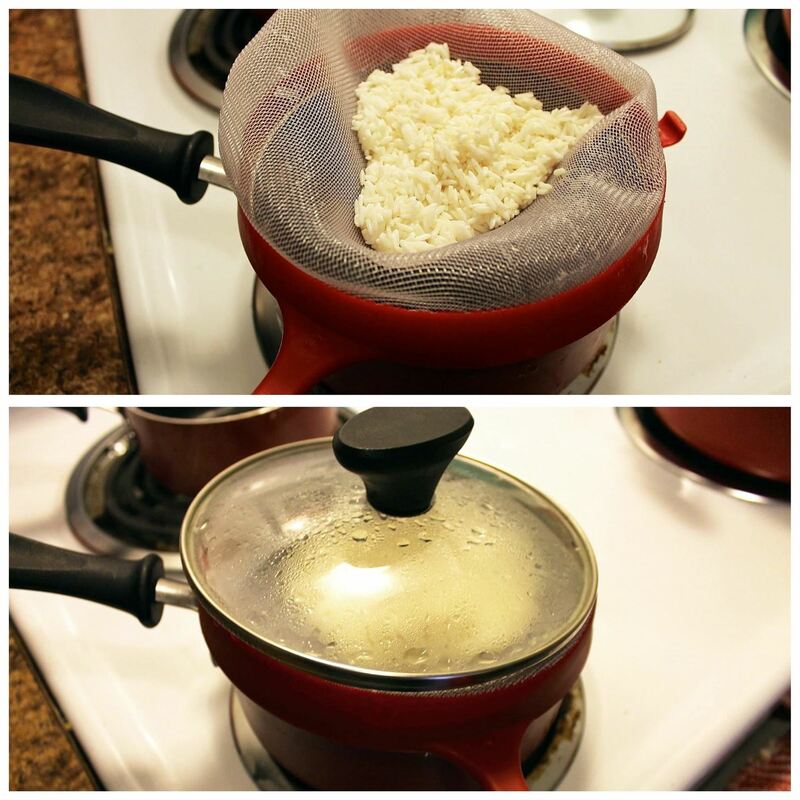 Gently remove the splatter guard and place the rice into a bowl. The splatter guard method has been approved by the amazing Thai food blog, She Simmers, so be sure to check out her complete instructions on this process. If it's a good enough hack for her, it's good enough for us. She also points out that, structurally, this hack is very similar to cooking in a Moroccon tagine. If you happen to have one handy, why not give that a try, too? 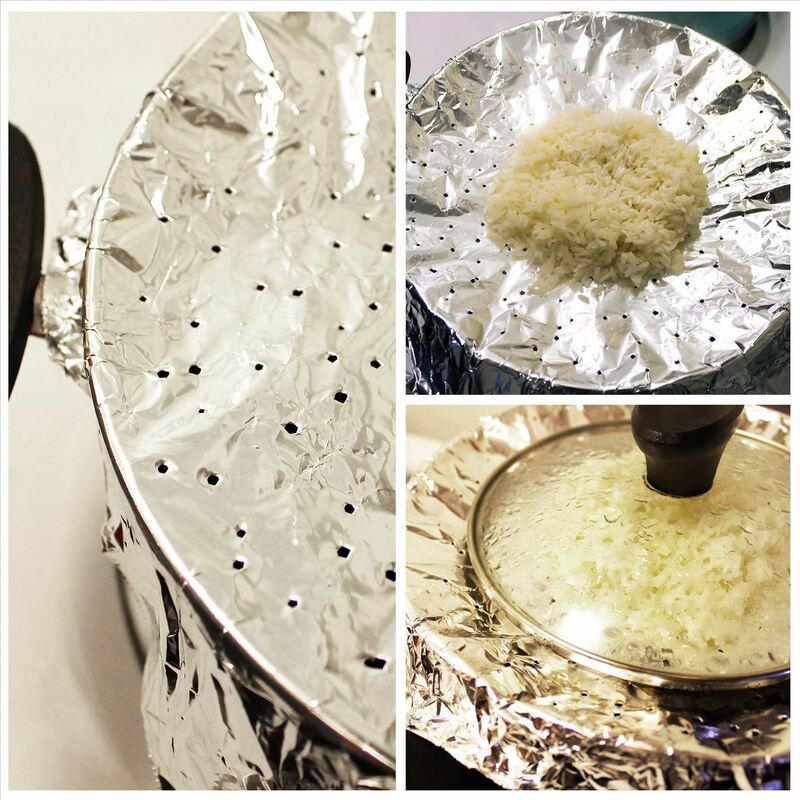 Here, the steps are essentially the same as with the splatter guard, only you have to do a little more leg work to create a faux steamer using a sheet of aluminum foil instead. To make your faux steamer, tear off a large enough sheet of foil to cover the surface and also wrap around the sides of your boiling water pot. Once the sheet is wrapped around the pot, use a toothpick to puncture holes over the entire circumference. You want enough steam to get through to cook the rice! And that's not all you can do with foil. There are plenty more tinfoil cooking tricks to discover! No splatter guard or out of foil? No problem. A regular, large-sized strainer works just fine. Again, the cooking process is the same as with the splatter guard, but there are a couple of extra tricks you should know. Turn the strainer upside down so it doesn't touch the boiling water. Next, push down the mesh so it creates a shallow bowl and place your rice in the pocket. It's probably best to stick with a mesh metal strainer rather than a plastic one in this case—you don't want to deal with melted plastic or the chemicals it might release. Tablespoon has a super easy method of cooking sticky rice with a pot and lid alone! They're pretty specific about soaking and cooking times, so be sure to check out their video below. And that's it. Please enjoy your new cooking tricks and eat all the sticky rice you can handle. Yes, it's absolutely necessary to rinse your rice beforehand: here's why. Want to make risotto but feel kind of lazy? There is an easier way. And if you're tired of spilling rice, beans, and other food staples, you need to make this DIY resealable grain dispenser.